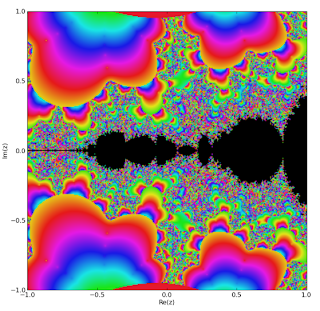 gaspaheangea notified me of a fractal rendering made by modifying my mandelbrot.py script to iterate a Jacobi theta function instead of the standard quadratic function. The result is quite gorgeous. By trying different parameters, still more interesting views can be found. With 100K points, the above image took about 20 minutes to plot. Arbitrary-precision arithmetic is really unnecessary for this (except at high zoom); the Jacobi theta functions can be implemented quite easily with ordinary floating-point arithmetic, and would be orders of magnitude faster as such. So if anyone reading this is looking for a fun math-related mini-project to work on, there’s an idea.